Join us for a conversation between Samantha Schnee, Chair of Words Without Borders, and Peirene Press publisher, Meike Ziervogel, with writers, Olumide Popoola and Annie Holmes, to explore the unique commissioning approach of Peirene Press. Ziervogel works closely with writers, commissioning Popoola and Holmes to go to Calais in 2015 to produce the collection of short stories, breach (2016). Peirene’s collaborative/commissioning approach with writers (and readers) continues with the forthcoming Brexit novel, The Cut, in collaboration with writer Anthony Cartwright. Annie Holmes was born in Zambia and raised in Zimbabwe. Many years later, she left southern Africa and filmmaking to enrol in a writing programme in California. Her short fiction has been published in Zimbabwe, South Africa and the US, and a novella-length memoir - Good Red - in Canada. She co-edited two collections of oral narratives in McSweeney’s Voice of Witness series: Hope Deferred and Underground America. 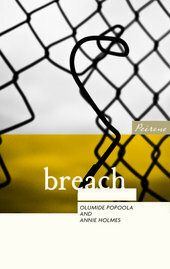 In 2016 she co-authored the short story collection breach with Olumide Popoola. She now lives in the UK. Meike Ziervogel is a novelist and publisher. She grew up in northern Germany and came to London in 1986 to study Arabic language and literature. She has worked as a journalist for Reuters in London and Agence France Presse in Paris. In 2008 she founded Peirene Press. In 2012 Meike was voted as one of Britain’s 100 most innovative and influential people in the creative and media industries, the Time Out and Hospital Club hClub 100 list. Meike is the author of three novels, Magda, Clara’s Daughter and Kauthar, all published by Salt in the UK. Her fourth novel, The Photographer, will be released in May 2017. Olumide Popoola is a Nigerian German writer of long and short fiction, based in London. Her publications include essays, poetry, short stories. Her novella this is not about sadness was published by Unrast Verlag in 2010. Her play Also by Mail was published in 2013 by Witnessed (edition assemblage) and the short story collection breach, which she co-authored with Annie Holmes, in 2016 by Peirene Press. Her publications also include critical essays (often on practice-led research and the novel), hybrid pieces and poetry. She lectures in creative writing, and is currently as associate lecturer at Goldsmiths College. Samantha Schnee is the founding editor and chair of the board of Words Without Borders, an online magazine of literature in translation into English; since its inception ten years ago, WWB has published over 1,600 translations from nearly 120 countries in over 90 languages. Born in the UK and raised in the US, Samantha also translates from Spanish and serves as a trustee of English PEN.